This steriliser is good, it does just what it says on the tin. It's a good design and feels sturdy and well built. Only downsides are that it's a squeeze getting it in smaller microwaves... I have to remove the plate in the bottom and I feel I could have probably brought a cheaper one without the 'brand' that does the same job. But I can't complain! It keeps everything clean and is easy to clean itself and simple to use. i love this. the last thing anyone wants when they have a baby it extra work and this easy t o use did that for me. straightforward no messing about. however i do think its a bit expensive. Easy to use, portable, excellent for the microwave. Only just fits in the microwave, a tight squeeze. I love this steriliser. It is so easy to use and you can simply fill it and put it in the microwave. It was a tight squeeze in my microwave to fit it in, but it is well worth it. It makes bottle sterilising so much easier and faster. I was actually given this avant bottle sterliser to take with whilst on a three week holiday. I actually used it with another brand of bottles thinking that it was universal. Silly me it wasn't! 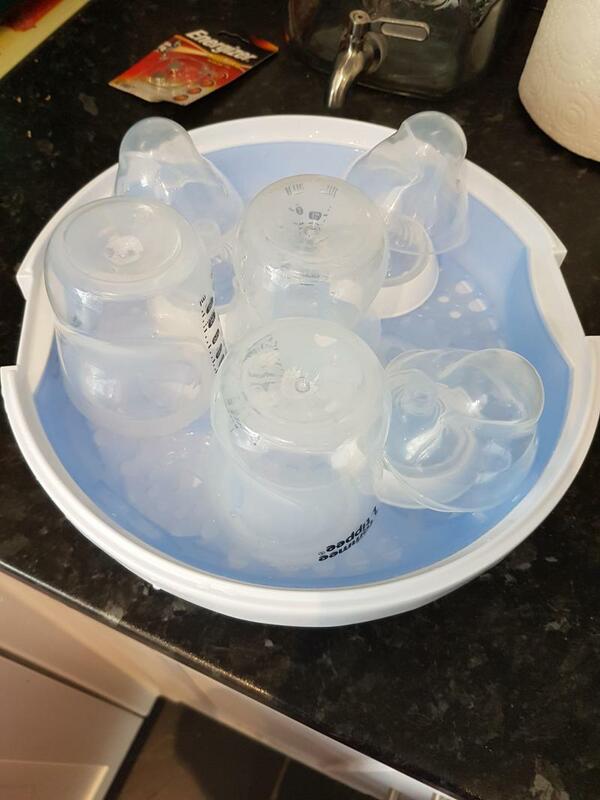 However although it wasn't a perfect fit I still used it with my tommee tippee bottles and it worked well, kept the bottles sterlised for 24 hours. It's easy to use just add some water at the bottom and assemble it and pop it in the microwave. No complaints from me. Quick and easy to use. Comes with picture instructions on how to fit everything in. It only just fits in my microwave. This steriliser is so quick and easy to use. Ready to go, sterilised bottles in 4 minutes. It comes with an instruction manual, with pictures to display how to stack the bottles/teats etc perfectly in the sterilser to ensure everything is clean. The steriliser itself is very easy to clean. The one downside to it, is that it almost doesn't fit in my microwave! The microwave steriliser is so simple to use. I just wash and rinse my bottles and stick them straight in the allocated spaces labelled within the inside tray. It takes 5 mins in the microwave. It's easy to clean either by hand or you can pop it in the dishwasher. It's less bulky than the electric ones and you don't have to worry about buying sterilizing tablets. All you need is your microwave and some water and you're good to go. I have used this steriliser for my little boy since birth. It is so easy to assemble the bottles inside, and takes just 4 minutes in the microwave. (Time depends on your microwave) the fact that only 4 bottles fit in at a time isn’t an issue for me as it is so quick. Great product, would recommend. Good and simple to use, cheaper to get than the electric one. Quite bulky and can be too big for some microwaves. Cannot take too high bottles as lid wouldn't close properly. Good value for money. The Philip Advent microwave steriliser is very easy and straightforward to use. The bottles are ready super fast, and is much quicker than other products on the market. 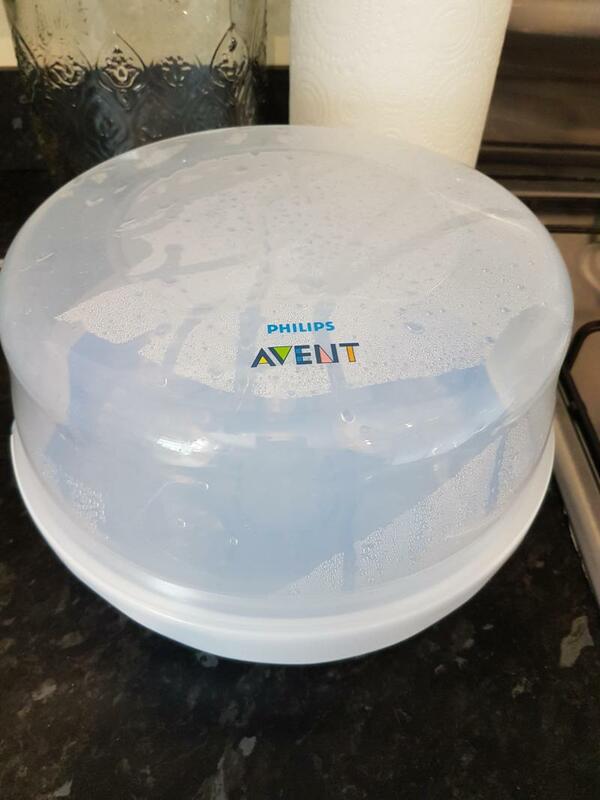 Can be quite hot when you first take of the lid when removing from microwave. Easy to use, lots of room, easy to store. Amazing product which can easily fix 6 bottles in if you arrange it well. Easy to store in the microwave after use. Haven’t had any issues with ours, does what it says on the box. I love this microwave steriliser. It takes 5 minutes in the microwave. It is easy to load, with spaces to let you know where bottles should be place. Fantastic for the price. I have used this product with both of my children. Used this for everything for my daughter and plan to use it for the next baby. Easy to use and sterilises things so quickly. Not sure if it would smaller microwaves, but worked well for us. 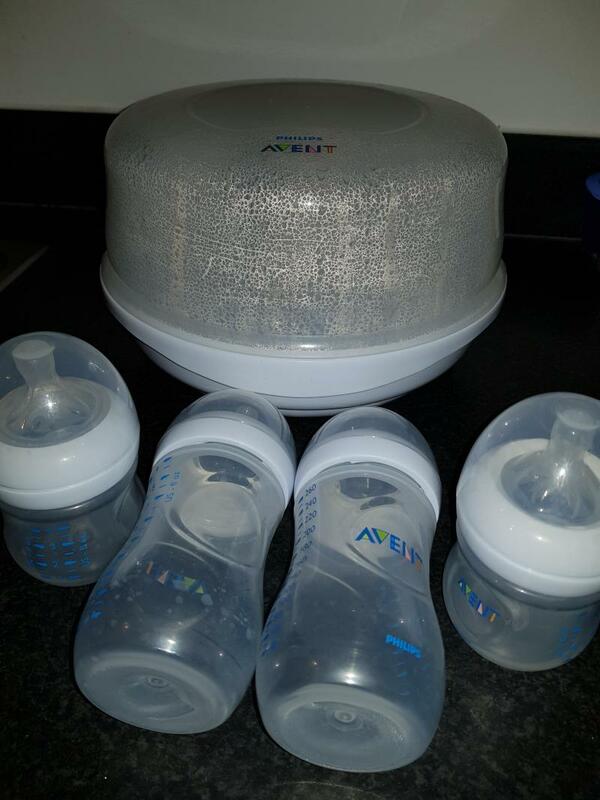 I have used avent on both my kids and wouldn't use anything else. A very good product. Quick to use and sterilised in 5 mins. It has fitted in both my microwave however i would say it may not fit all. Makes cleaning bottles a lot easier. I love this. I have had it since my son was born and with the constant feeds at the start, it makes life easier. It's small, takes up little space and your bottles are cleaned within minutes. The bottles always come out clean and I have never been concerned that it doesn't clean well. Also cleans dummies really well. I use this with non Philips advent bottles. I can fit 3 sets in but do need to stack strategically. It sterilises the bottles with little water and in just 6 mins. Very useful and leave bottles nicely sterilised. I have used a avent sterilizer with all my children and would never use another brand. they are so simple to use and bottles are ready in minutes. I love this! It’s so simple to use and doesn’t require anything other than water to sterilise. The rack has plenty of space and is designed to maximise the amount of vita you can sterilise. The instruction book even shows you how to stack bottles, lids, tests etc. The only drawback for me is it’s quite a bulky thing to have lying about in the kitchen. A really simple to use product. The steriliser sterilises bottles within 4 minutes in a microwave, which is quicker than most plug in sterilisers. The bottle holder clearly shows how the bottles, teats and lids need to be positioned to ensure that everything is sterilised thoroughly. The size of the unit means it can fit in most conventional microwaves and therefore perfect for taking on holidays (something we did recently ourselves and worked brilliantly!). This product is very reasonably priced in comparison to other sterilisers on the market and available at many retailers. The only downside to this product is that you can fit 4 bottles and coordinating parts in comfortably, but not other items such as sippy cups, unless they are put in separately. Easy to clean. Very quick. Can't get many bottles in. I've used plugged in steamers and they always get dirty quick and take longer. 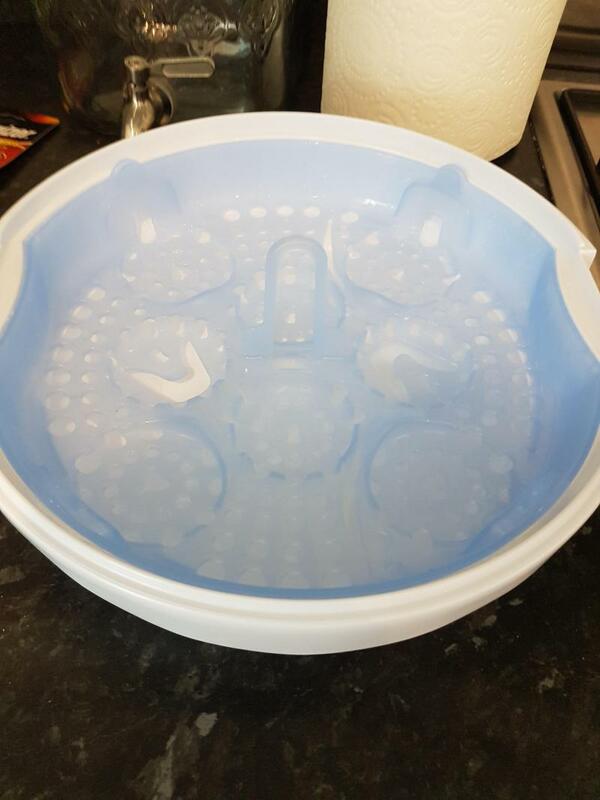 This steamer is great it's easy to clean, takes 2 mins in the mircrowave and wont mold. I highly recommend this and wouldnt use any other. Can even fit in different product bottles. Steam is the ultimate means of sterilising your baby products to protect from harmful bacteria. 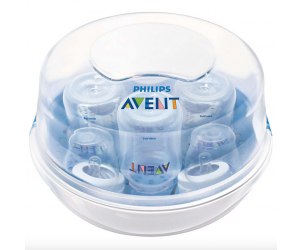 This Philips AVENT steam steriliser uses the samed method as used in hospitals, is super convenient, and uses no chemicals. 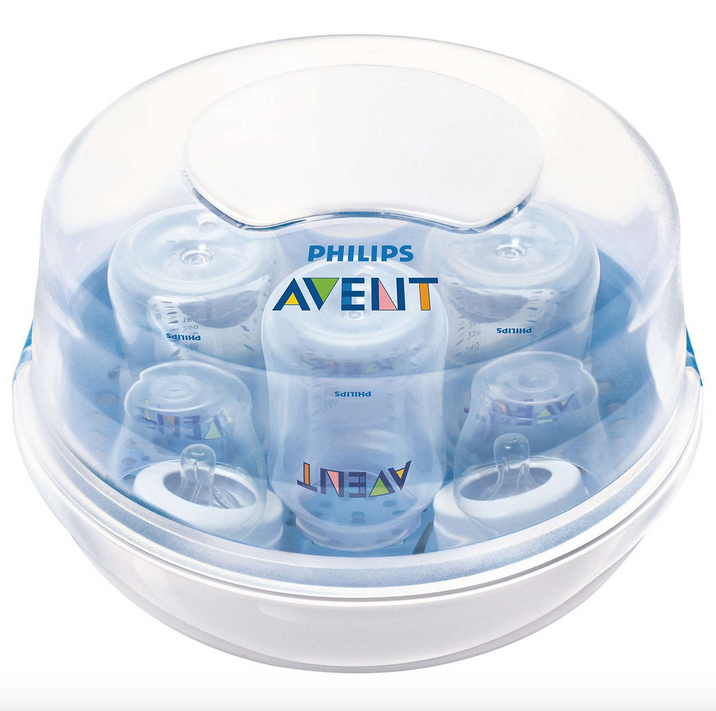 The Philips AVENT Microwave Steriliser has a compact size and can fit in most microwaves available. Really portable so you can take it whereever you go, to ensure you can keep sterile up to 4 bottles at a time with minimal effort. Anyone can master its use; just add water, pop in the bottles (or what ever needs steralising) and microvave for 2-6 minutes (depending on wattage of your microwave). There are side clips to ensure an effective seal, and contents will remain sterile for up to 24 hours if the lid remains closed.